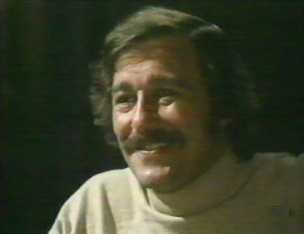 Murray Hayne's acting credits include two episodes of The Avengers, including the penultimate episode - My Wildest Dream in 1969, in which he played Gibbons. Murray was a member of the Birmingham Repertory Theatre in 1961, his contemporaries there were Derek Jacobi (I Claudius), Rosemary Leach, Bernard Hepton (Albert Foiret in Secret Army) and Wolfe Morris ( Padamsambhava in Doctor Who: The Abominable Snowmen). 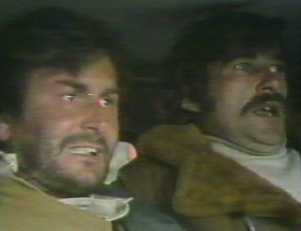 Above: Murray Hayne is threatened by a young Peter Vaughan in 'My Wildest Dream'. Matthew Long was a regular in Coronation Street, played Arthur in The Sandbaggers and made appearances in both The Avengers and The New Avengers. Paul Chapman is probably best known for his regular appearances as Stephen in the BBC Judi Dench/Geoffrey Palmer comedy As Times Goes By and for the part of Peg-Leg Pogson in Channel 4's Fairly Secret Army (also alongside Geoffrey Palmer) over two series in 1984 and 1986.